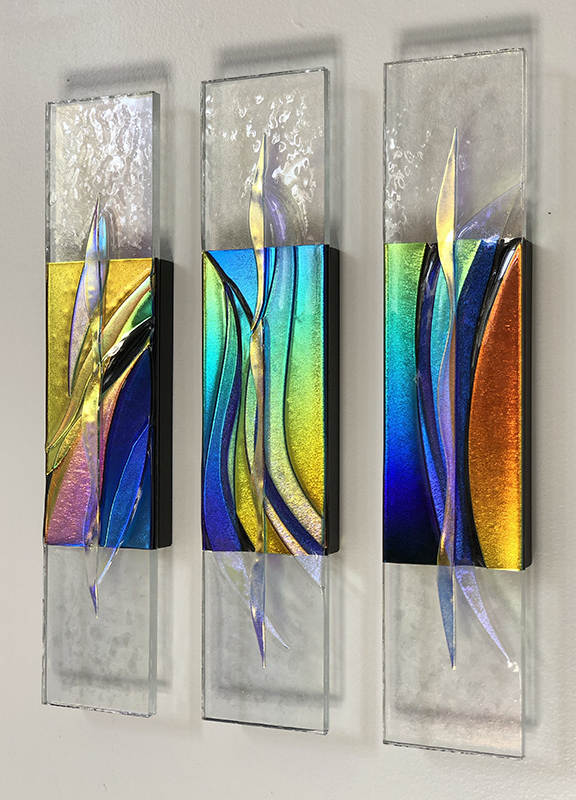 Artist Syed Ahmad is part of a continuum of working in glass from its purported beginnings in ancient Mesopotamia in about 3000 BCE to today. Through the centuries, some cultures lost knowledge of the technique that simultaneously evolved in Egypt, Mycenae, China, and North Tyrol. The first glassmaking manual from the library of the Assyrian king Ashurbanipal (669-626 BCE) dates to around 650BC. Other cultures, such as the ancient Romans and the Venetians were renowned for the quality and quantity of the glass they produced. 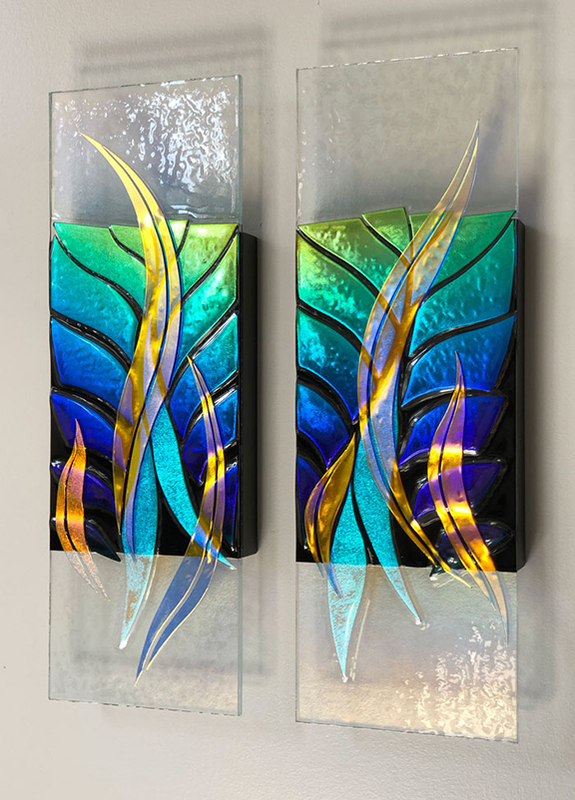 Glass has never been an easy medium for a craftsman or artisan, it requires a very hot and consistent source of heat (read “courage”) and the ability to work quickly and as precisely as possible. “Finally, I just let the glass tell me how it wants to be treated,” said Syed. Syed, a native of Malaysia came to the United States to become a Geophysicist, earning his degree in 1986, just about the time the world’s production of oil was in a glut. While living in Texas he met and married his wife, a tapestry weaver. They opened an arts and crafts export business and did well. With time, Syed took an interest in jewelry making, crafting his own glass beads. 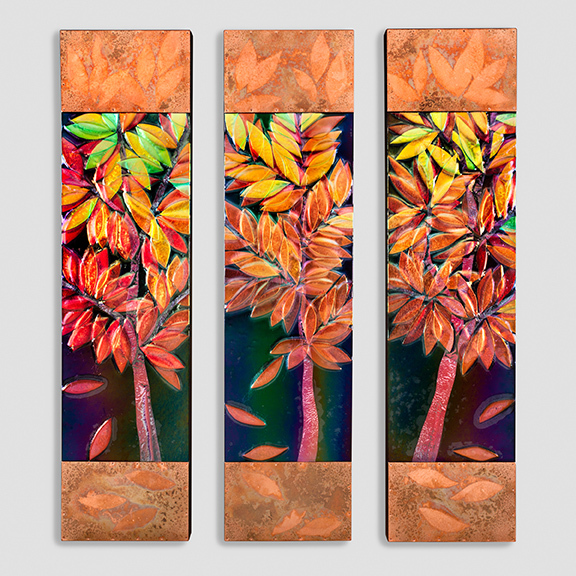 “In time I became interested in creating larger art pieces in glass. That control I had with small things was gone. Because I work instinctively, I met the challenge,” said Syed. 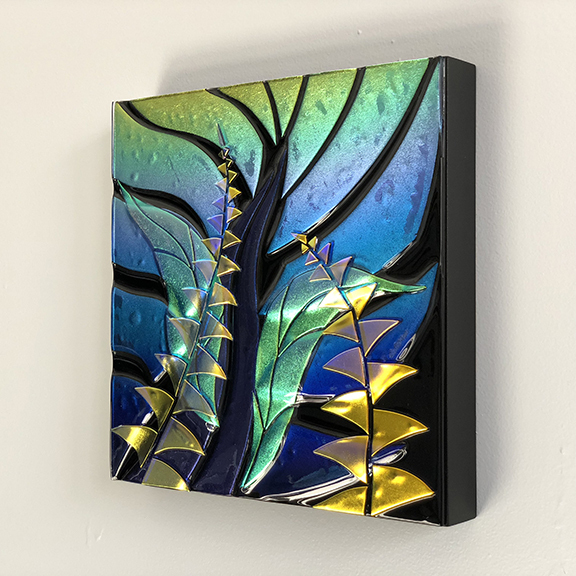 Syed is employed as a full time artist, selling his glass at art festivals and to clients who have commissioned his decorative pieces for their homes and offices. 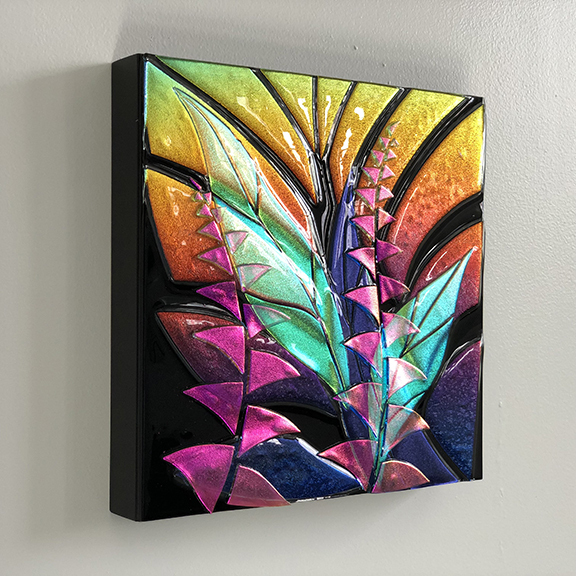 He won the South Miami Rotary Art Festival’s award in February garnering second place as “Best in Show.” He has sold his work at the Coconut Grove Art Festival and his pieces are featured in galleries all over the country. 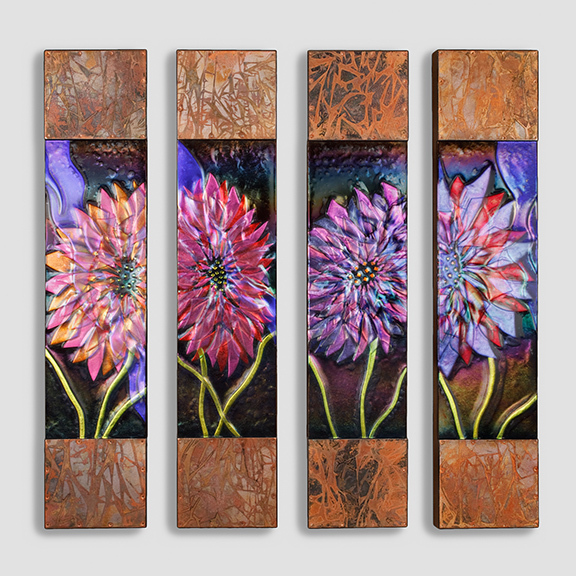 The artist lives in Salisbury, North Carolina. 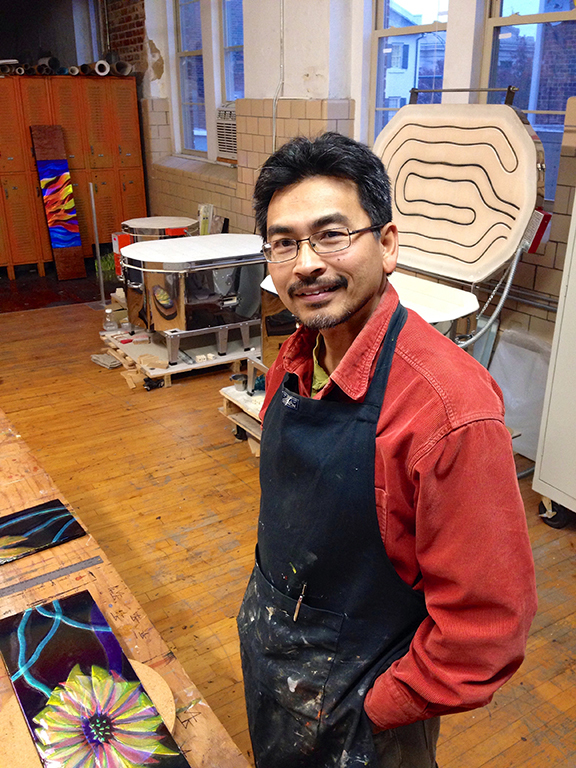 He works in a studio that has the capacity for him to design and produce large works of art. 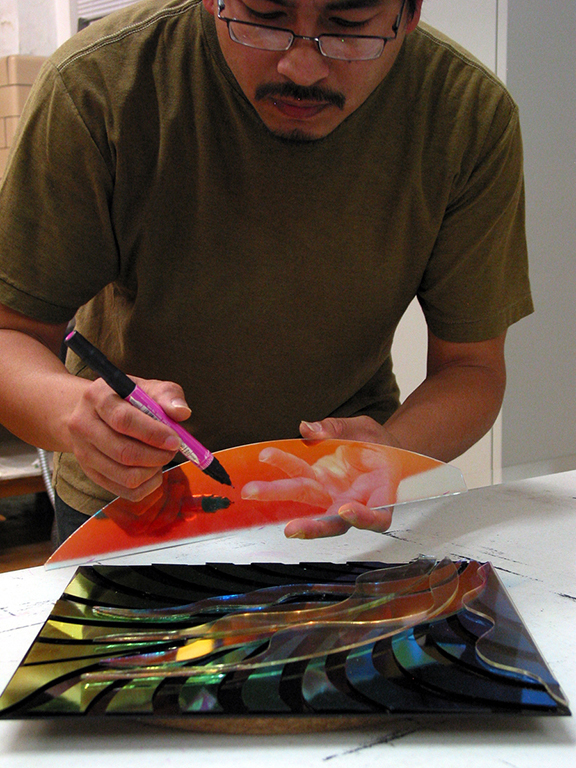 His technique includes fusing dichroic (two-color) glass to use for its fascinating multicolored and reflective properties. 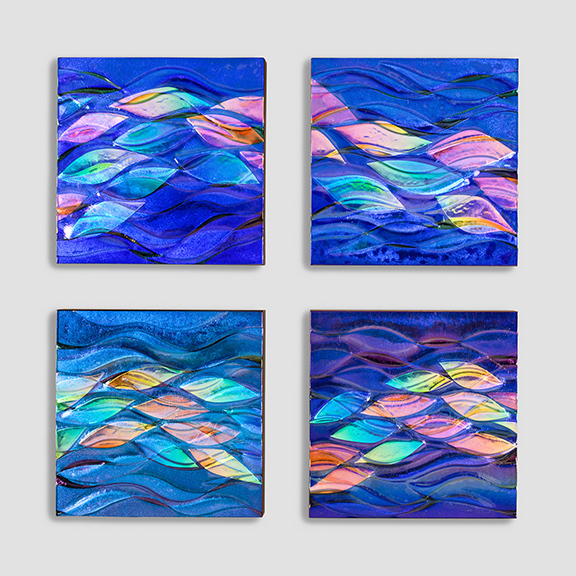 The fused glass appears to have more than one color at the same time and changes with different lighting. It is a bit like seeing a rainbow pattern in a soap bubble or the sun on a dragonfly’s wings. The process was first used by the ancient Romans. 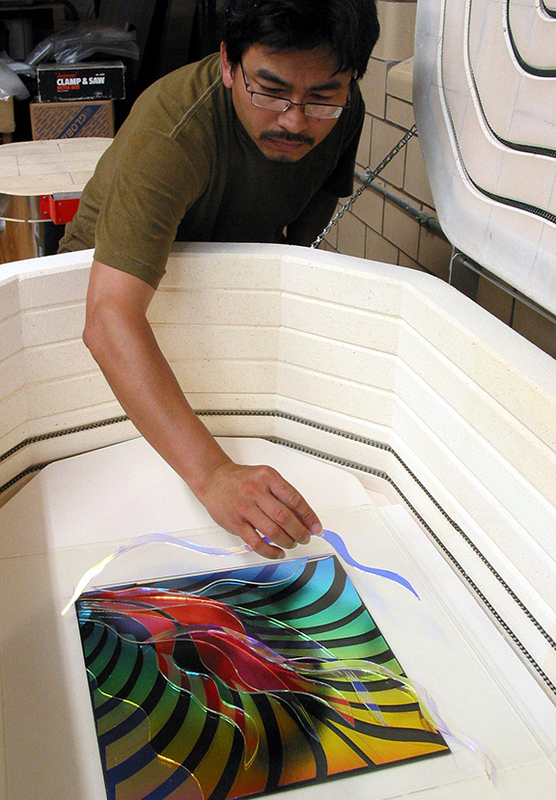 Many thin layers may be arranged and then fused in a very hot kiln. 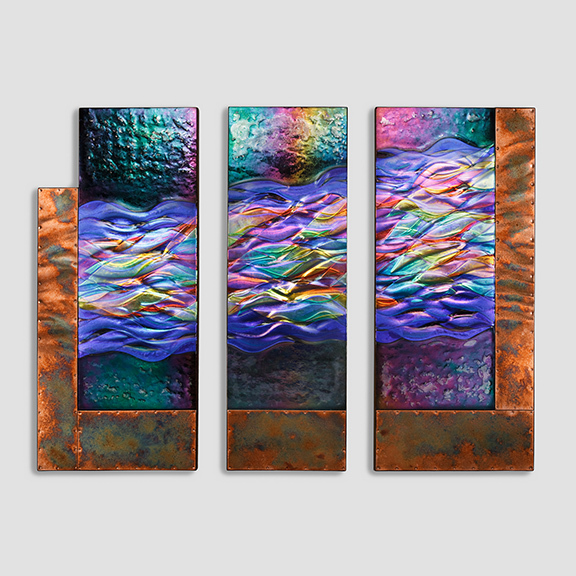 In his recent work, Syed is incorporating metals with the glass, using aluminum and silver. 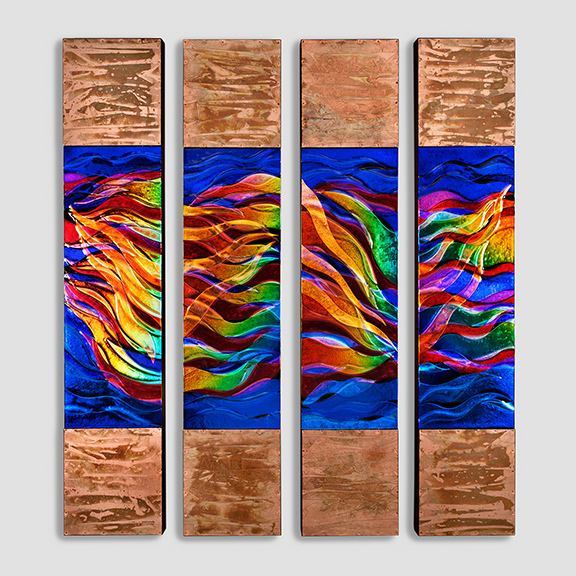 He says that the cooler colored metals work well, but he favors the warmth of copper the most. “My method is improvisational. 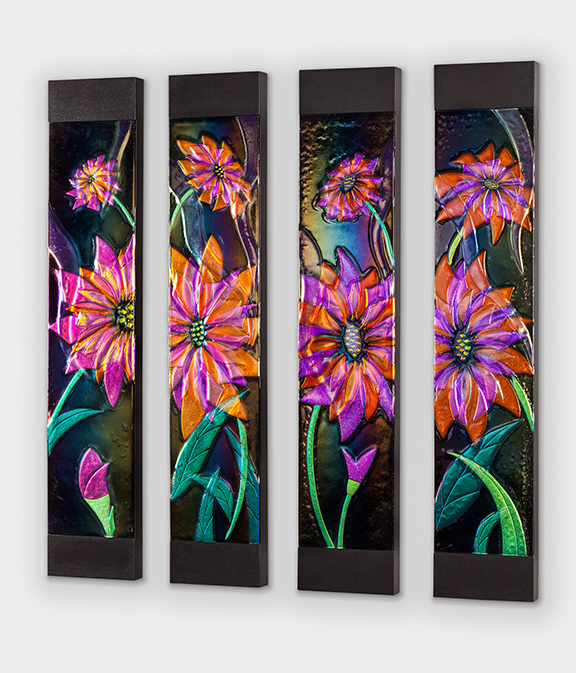 The glass sheets I have at hand and the image in mind will do their dance back and forth. 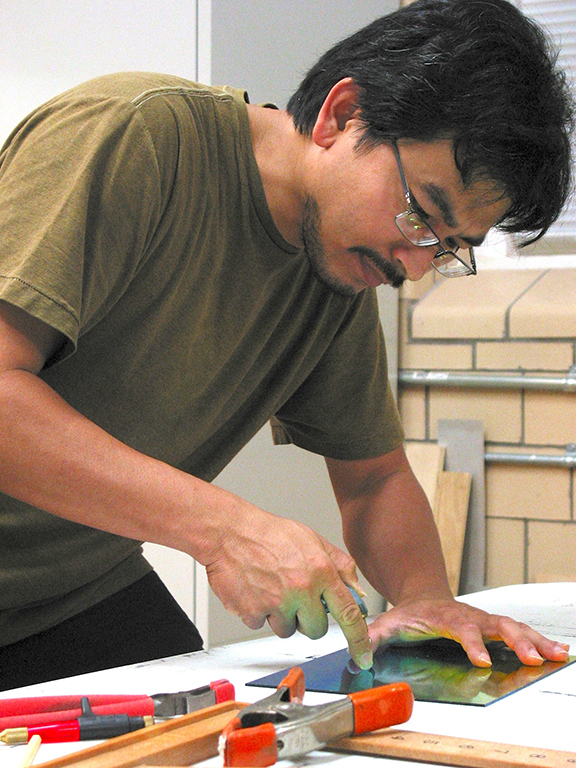 The medium imposes as its will as much as the artist does. Glass, unlike paint will not bend to your will,” said Syed. 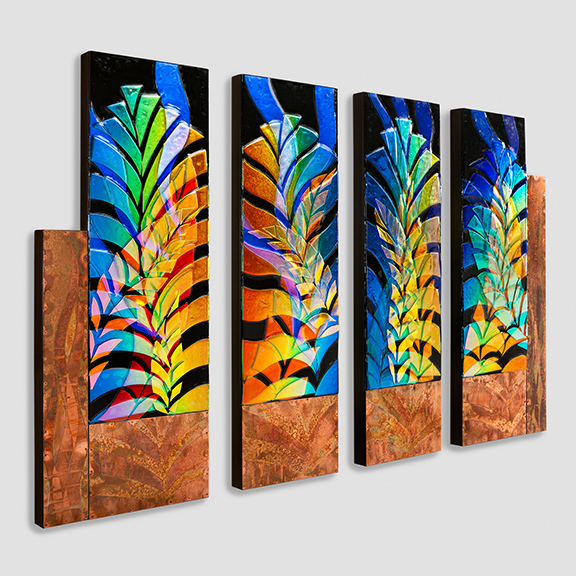 Syed Ahmad’s work can be seen at www.syedARTglass.com and he can be contacted at syedARTlgass@gmail.com.